It's a dark, sweet cherry with a splash of vanilla almond milk. You do NOT need to purchase FA Milk to make this. FA Cream Fresh makes a good 1:1 sub. Or try CAP Sweet Cream as a 1:1 sub. Or use OoO Cream Milky 1.5% or TFA Sweet Cream 1% instead of 2%. If you don't have TFA Vanilla Swirl, first of all, what's wrong with you? Second, try your favorite creamy vanilla. 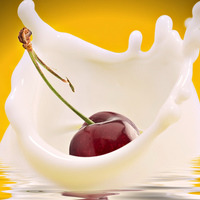 It's really not important, just use whatever you think will splash this cherry with a lightly vanilla'ed vanilla milk. 1% INW Shisha Vanilla would probably be good. TFA Cherry Extract/WF Black Cherry Jelly Bean/INW Marzipan are the non-negotiable components of a dark, sweet natural cherry. TFA Cherry Extract is pretty much the cherry version of TFA Blueberry Extra. I think you have to suffer through at least half a dozen nightmarish cherries to appreciate that as a very good thing. It's a darker, natural-type cherry, nothing like a bright red cherry candy. It's a pretty weak concentrate both in terms of standalone strength and getting bullied in a mix. It suffers from an almost overwhelming mediocrity, in that it is neither sweet nor tart. It's flat and thin and has no texture to speak of. But it also lacks the horrific off-notes characteristic of many cherry flavors, and in a world of idiots, the average man is king. WF Blackcherry Jelly Bean SC is one of those idiots. Down real low you get just a tease from a nice sweet black cherry candy flavor. You want more. You add more. Makes sense right? Nope. Nightmare plastic flavor and some harshness to boot. Here I just use a touch of it to push that cherry extract to be a sweeter, darker, bolder cherry. Goodbye mediocrity! If you're not as sensitive to it as I am, you can definitely bump it up to 0.5%. I tried that, liked it, just prefer the 0.25% version a little more, 0.5% is starting to get just a hair candied for what I was going for. INW Marzipan has always tasted more like cherry extract than anything else to me. It's thick and creamy and a tiny amount of it gives that thin TFA Cherry Extract some meat. The hint of amaretto-like almond it brings along just completes the milk. It's a strong flavor, but it can also be bumped up (or accidentally overdripped) to 0.5% without ruining the mix. This is not a well-tested, carefully refined recipe like the kind I usually share. I'm throwing this out here with just an overnight steep after comparing several slightly different batches using the same ingredients. It probably gets even better over time? Unless Vanilla Swirl mutes it all to hell. I won't make a habit of this. My ATF recipes are not LIVE MIXING. So, why the rush this time? Just wanted to share one idea of what to do with TFA Cherry Extract with anyone who might have noted that Bull City Flavors now carries it and decided to pick some up. We'll cover that cherry and many more cough syrup...er.... cherry flavors on NOTED on the DIYorDIE Youtube channel Monday night, 1/22/18, at 11 p.m. Eastern. Thanks your your help with this one and with so many other things @DigitalDrops! I subbed FA Cream Fresh in place of FA Milk because I’m not cool enough. This recipe is awesome. It’s really good fresh, but I found that it turns into something special after a few weeks. The cherry here isn’t medicinal at all. It’s sweet and the bit of black cherry jelly bean makes it pop. Meanwhile, marzipan seems to guide the recipe away from candy-like sweetness. The super simple cream base is full-bodied and rich. The cherry layer and cream layer are balanced together really well. I don’t know, it’s just a very satisfying cherry cream. Tasty stuff, Dave! This is great! This is an authentic dark ( sweet bing ) cherry-almond-cream combo and it is on point. This turns out fabulous! This is the first cherry that actually doesn't taste like cough syrup! Well done! I used devon cream @ 2% in place of vanilla swirl and fresh cream cause no fa milk (yet).. a little super sweet and polar blast because thats how i like it.. and i gave it the 3 minute steep and it's so good i can't even believe i ever thought the earth we live on is a globe... because it certainly is not.